There are still many small houses here, even with the water so close at hand. It was a quiet Saturday afternoon, and along with a couple walking their dogs and distant flocks of gulls I saw a winter hare, a fox and a racoon. This entry was posted in art, urban landscape and tagged architectural landscape, cityscape, harbor, house, ocean, pastel, spring on March 9, 2009 by APo. Jean Warren sent me your link. I love your work. 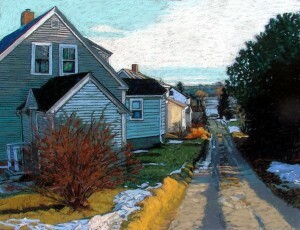 This painting captures the feeling of this little lane so well. We passed this street every day when we stayed in SW Hbr.at Pier One. Frances Thom, the recycled paper craft person lives in the house on the corner.